What a day! In this lighthouse bagging game you experience some days where, at the end, all you can do is throw yourself onto the sofa and say “wow, did that really happen?”. Today was definitely one of those days. It’s our final day on Islay and Bob had been in touch with Gus and Rebecca from Islay Sea Adventures in the lead up to our visit to Islay to sort out a trip taking in some of the lighthouses in the Sounds of Jura and Islay. Gus had said that Friday looked to be the best day for it, so this morning we arrived at Port Ellen and spent a while throwing on even more layers in preparation for a RIB trip in January (mental!). You can’t imagine my delight at seeing a beautiful covered RIB gliding into port. Covered RIBs are my favourite! Before we’d even got on the boat, Gus offered us a cup of tea and we chatted to Gregor who was helping him out on the boat while Gus went for the hot drinks. A short time later, and with tea firmly in hand, we set off and Gus offered to sail around the Carraig Fhada/Port Ellen lighthouse on the way out. It was great to see a bit more detail from the sides you can’t see from the land. We asked Gus if the walkway is covered at high tide and he said that it can be, and that a man and his son were washed away trying to reach the lighthouse about 100 years ago. Regardless of that, it really is a lovely tower, and the sentiment behind its history is wonderful (more details of this can be found on the Canmore website). I would be quite happy to have a lighthouse built for me (preferably while I’m still alive). With the cost of the recent trips though, I don’t think Bob would be very willing to oblige! Back on the waves, or lack of I should say, off we went again. A short time later we passed a few small islands and spotted a couple of sea eagles closer than I’ve ever seen them before. They are very impressive, but I wouldn’t want to be get too close! Eilean a Chuirn was destination number 1. I really like this kind of lighthouse, although I’m not entirely sure why it needs so many doors – perhaps so they can access it in high winds and which door they use depends on the wind direction. That sounds like the only plausible reasoning and would be my guess anyway. It’s a lot like the Waternish light on Skye. Gus explained that the large concrete block next to the lighthouse was part of the pulley system used for moving supplies from the landing point to the lighthouse. After a quick wave to McArthur’s Head, more on that one to follow, we went onwards to Na Cuiltean, which I’d seen from a distance from the ferry on Wednesday. It’s basically a solid platform with one level of the Northern Lighthouse Board’s flat pack arrangement on top. The base of the structure clearly takes a bit of a battering at times. One side of the base is almost completely covered in a layer of green algae and birds are obviously very fond of the rock it sits on! I was very excited about the next one. Skervuile isn’t really that far from land, but the land it is close to is very remote and fairly inaccessible, which makes seeing this one a bit of a challenge. I’d seen it as a small white pencil of a thing in the distance from the ferry. As we approached it was getting bigger and bigger and yet there still seemed to be some distance to go. It reminded me of a term I’d heard from Christian Nock who walked around the coastline of mainland UK: “lighthouse syndrome”. Anyone who has ever walked any distance to a lighthouse will know the feeling. You see the lighthouse and think “Great, I’m nearly there” and an hour later you are still walking towards it. Well, the approach to Skervuile was a little like that, except it wasn’t an hour. We did eventually get there though and I was very surprised to see the rock below it exposed. All of the pictures I’d remembered of it were at high tide where the sea completely surrounds the base of the tower. With the tide fairly low, the small landing platforms were also exposed. As with all rock lighthouses, I stood staring at it thinking “wow, I have no idea how they built that, but I’m so glad they did”! Eilean nan Gabhar was next on the agenda as we sailed back down the Sound of Jura. This one is a fairly standard flat pack, except it’s a flat pack with those Paps in the background from certain angles! I’ve become a little obsessed with getting pictures of lighthouses with the Paps of Jura in the background. The joy of it being that it is very easily done in the Islay/Jura area. I believe the term “commanding the landscape” is very apt as that is exactly what the Paps do – well, until you stick a lighthouse in front of them, of course! Another wave to McArthur’s Head as we entered the Sound of Islay. The ferry had given us a very good view of Carraig Mhor, to the south of Port Askaig, on Wednesday, but this was an opportunity to get even closer. Not landing close (although that would have been possible, but was not a priority for today). With the reduced elevation compared to the ferry, and the calm sea conditions it was also a good chance to catch some nice reflection shots. Love a reflection! It still looked from our closer angle like it would be quite difficult to access by land. From the ferry on Wednesday, I’d quickly caught the little lighthouse, Carragh an t-Sruith on the west coast of Jura. Very similar in appearance to Eilean a Chuirn, this one looks to be a nice little walk from the landing point for the ferry across the short stretch from Islay. Must put that on my “to do” list. Ruvaal hadn’t been part of the original plan, but I asked Bob this morning if we would be going that far. I think he sensed from my tone that I wanted to go there. We asked Gus nicely and he was more than happy to add it on. On the way there he told us about the couple who own the lighthouse and how they manage being such a long way from a road. The majority of their journeys to Port Askaig are done by small boat. They do have a quad bike to drive across the difficult terrain, but Gus explained that the land they cross is mostly mud. He had once driven up there on the quad once with a passenger and saw a big puddle, which he thought he could get through. As it turned out, a pole had blown down in the wind and had been removed along with its base, leaving a gaping chasm (my words, not his). So, Gus ended up stuck in this gaping chasm with water almost up the seating level in the quad. Fortunately he was able to get them out and back on the track. The challenges they must face seem endless to me and it would take a certain type of person to be able to live (or enjoy life) there. As much as I love lighthouses, I would need to draw the line when it comes to choosing which one to live in, and Ruvaal falls below this line! Having said that, the lighthouse is beautiful. Incredibly slender! If I were a lighthouse, I would want to look like Ruvaal. It was lovely to sail around it and see the side with the windows too. Maybe I could live there – perhaps – just for a few days. We had purposely saved McArthur’s Head for the way back. We’d rather cheekily asked Gus if he thought it might be possible for us to go ashore there and climb those glorious steps. He explained that it is not possible to land at low tide, he’d once been stranded in a nearby cave due to the tide going down. To maximise our chances of landing, he suggested saving it until the end of our trip when the tide would be in. He wasn’t wrong and I may have squealed a little (just a little) when he said that he’d get us in! We hopped ashore and made for the steps. I approached the steps thinking that there weren’t that many and it would be easy enough. About 10 or so steps from the top I changed my mind. It’s a long way up! But it was so worth it. The lighthouse, while not unlike a number of others in the area, was stunning and the extra effort you put into getting to it adds to the enjoyment. My favourite views though were from the end of the path beyond the lighthouse looking back at it with Jura in the background. Just beautiful. Gus told us that the lighthouse was painted last year and they flew in 2.5 tonnes of paint for the job. I imagine at least half of this paint was used on the wall rather than the tower itself. The wall is so long that I didn’t even realise we were inside it! McArthur’s Head now holds the record for the most number of hugs it has had from me (3). I even enjoyed walking back down the steps. I can’t decide though whether the lighthouse looks better from the land or from the sea. It is just an all-round wonderful lighthouse and I want to go back already! Heading back to Port Ellen, the sea eagles were out in force again, being wound up by some gulls. Gus had told us about a group of stags he’d seen swimming between islands near Eilean a Chuirn the other day. By some wonderful chance, we spotted one in the water as we passed. Gus did a very quick and very sharp turn in the RIB to enable us to see the deer swimming at close range. After it arrived on the island it looked back at us briefly before wandering off onto the island. For a change, today has been a shorter day. In a recent post I mentioned the benefits of winter: being able to catch lighthouses at sunrise and the lights in action. The downside, though, is the later starts and earlier finishes. It’s still been a productive day though. Two lighthouses beckoned this morning, and when they call one must go! The first was the Rinns (or Rhinns) of Islay, which resides majestically on the island of Orsay off of Port Wemyss. On the way there we passed what was to be our second stop of the day, Loch Indaal at Port Charlotte, and had a quick look at how we might be able to get access to it. While the field to the north of Loch Indaal House (which is available as a holiday let – the views of the lighthouse at night would be wonderful from there, I imagine) was home to a few young Highland cows, the field to the south looked a lot more inviting with just a few sheep roaming around. Back to that one shortly. As we approached the small but very picturesque village of Port Wemyss the Rinns of Islay lighthouse just appeared out of nowhere, considerable bigger than I expected it to be. While I knew it wasn’t a huge stretch of water between Port Wemyss and Orsay, I hadn’t expected it to be so close. One of the first views we had of the lighthouse was fantastic. Heading straight for the coast with houses on either side of the road, the lighthouse was perfectly positioned at the end of the road, looking almost like you could drive right up to it. There are some wonderful spots to get views across to the island and lighthouse from the coastal road. A perfectly positioned picnic bench is just up the hill slightly from the slipway. A wonderful spot to spend some time “lighthouse gazing” and enjoying the moment. One day I hope to make it across to the island, but it’s not on the plan for this week. Something to look forward to another time. Returning to Port Charlotte, we parked up in the village and wandered along the road until we reached Loch Indaal House. I asked my usual “are you sure we’re allowed to go through this field?” and Bob reassured me for the 500th time that it was absolutely fine – we are in Scotland and there is “right to roam”! Onwards we went. I’d already said that I wanted to get a picture of the lighthouse with the Paps of Jura in the background, so we walked slightly further south before heading to the lighthouse. The best place to get this picture is actually from the road where the Paps still manage to look about the same height as the lighthouse! Where yesterday the Paps made Na Cuiltean lighthouse appear so small and insignificant, Loch Indaal light won this time, but only once we’d made it to the bottom of the field! It did make for a lovely view. No blue skies today, but also no rain and very little wind. It’s a nice rocky area to wander around and we slowly made our way towards the lighthouse. The tower is a fairly straightforward affair and reminded me a lot of the tower at Corran. It’s no wonder really as they were both the brainchild of the wonderful Stevenson team that was David and Thomas, with Loch Indaal first lit just 9 years after its twin on the mainland at Corran. I mean, why reinvent the wheel?! Interestingly, the Northern Lighthouse Board (NLB) face plate next to the door says “Loch Indaall”, but most spellings appear to only have the one ‘l’ on the end – even in places on the NLB website. It’s not the most astounding of lighthouses, but it’s really easy to get to and in a lovely location. After a lunch break, we hit the road again with Bob shuttling us all (the four of us and his mum) to Port Ellen in two runs. I was dropped off first which gave me the chance to go on ahead to the Port Ellen lighthouse, which in these parts is more commonly referred to as Carraig Fhada. It’s a nice little walk around the coast and the lighthouse is visible pretty much all of the way along. It doesn’t resemble a lighthouse in the traditional sense, but it looks wonderful and you just can’t help but take numerous pictures on the approach. Well, I would have done just that had a couple and their two dogs not entirely ruined my view by walking out to the lighthouse at completely the wrong time. I can’t complain about them too much though as the man pointed out a heron on the rocks on the way out, so I managed to get some decent pictures of a heron (not really my sort of thing, but good to have to share with my birdwatcher dad). The best pictures and views though, in my opinion, are to be had near the entrance to the narrow walkway that leads out to the lighthouse. When you see a little walkway like that there is nothing for it, you just need to walk it. It could be pretty hairy at times I imagine and completely unwise to walk out in rough sea conditions, maybe even verging on impossible without getting washed away. I was splashed a little once on the way out and today has been really quite calm. It’s a great little wander. There’s not a lot to see once you are at the lighthouse. It’s a relatively small rock that it sits on, so you can’t get any decent pictures of the tower. Crossing back over the walkway I made my way back towards the cemetery where I’d been dropped off and met the others on their way to the lighthouse. We all bagged the lighthouse and had a walk along to the Singing Sands, which didn’t appear to be singing today (apparently the wind was coming from the wrong direction). On the way back to the car, I managed to get those pictures I’d missed out on due to “that couple” with the dogs. All was well in the end. I should add that, as we arrived in Port Ellen this afternoon, I spotted a few flashes straight ahead. Considering it was still daylight at this point, I was quite amazed, and intrigued. Looking at the map, I wondered if it might be one of the lights on Rathlin Island off of the north coast of Northern Ireland, most likely Altacarry Head. Bob wasn’t sure. Having looked into it a little more though, I am very pleased to have been proven right. Altacarry Head, or Rathlin East, lighthouse does indeed flash 4 times every 20 seconds as we had seen and, very interestingly, does so 24 hours a day! This has been the case since November 1995 and was introduced to “improve the daytime conspicuity of the station”, as stated on the Commissioners of Irish Lights website. That explained everything. While yesterday was all about visiting new lights in the north of Northern Ireland, today the objective was to improve upon those we’d seen a few years ago along the south and east coasts. In the lead up to this trip we had been in contact with a local boat operator who had an unconfirmed booking with another group, but had said he would be happy to take us along Carlingford Lough for closer views of Haulbowline as well as the two smaller lights, Vidal Bank and Green Island. Unfortunately, we were informed that the other group’s trip was going ahead so it wasn’t possible for us. Although Bob tried to make contact with an alternative operator, we had no success. The back-up plan was paddling! We’d been lucky with the tides yesterday for seeing the lights on the banks of the River Foyle and, in particular, managing to get close to the Otter Bank light. Today, we decided to make sure the tide was in our favour again. It obviously meant an early start, as is often the case with these lighthouse days, although thankfully not as early as yesterday. Arriving in Greencastle, we decided to have a drive around to see the nearest place to see the lights from, focussing first on Vidal Bank and Green Island. As usual, Bob chose to park somewhere that I couldn’t possibly recommend people park when they actually visit themselves, but fortunately we checked out the access suggestion I will include in my book and that was fine. We walked onto the beach, wellies on, and I headed straight towards the Vidal Bank light, walking in as far as I could without getting my feet wet. It would not have been possible to get to the light, or its neighbour Green Island, anyway so it wasn’t worth even trying. We had the zoom lens so that helped with getting better pictures anyway. There were a number of oyster beds nearby and we strolled alongside them to reach the closest point to Green Island. Again, in I went to get some pictures, while Bob hung back on the beach using the zoom lens! There’s not a lot of difference between the two lights, but we did spot that the green section of the legs on the Green Island light came further up than on Vidal Bank. Also the orange triangular daymarks on them were in different orientations and at different heights. This may sound like unnecessary information, but will prove to be very useful for working out which is which in pictures. Having seen the pictures included here so close together it is obvious that they are a bit different. While we’d been hanging around the smaller lights, we were very aware that the beautiful Haulbowline rock lighthouse was a short distance away. It was even less likely that we would reach this one at low tide, but I felt that need to paddle again. This time I had the zoom lens, which helped. The sun was still low and I always think this is one of the benefits of visiting lighthouses at this time of year, as you can catch the colours of sunrise and sunset on the towers without having to get up at some ridiculous hour or stay up too late. Haulbowline has all the magnificence and elegance of a rock lighthouse, but without the need to spend hours on a boat to reach it (well, technically we had to get the ferry to Northern Ireland, but you hopefully see my point). There were some beautiful houses along the north bank of Carlingford Lough and I can see why. If I had a potential view of Haulbowline from my house I’d want massive windows too! From here we headed north. I was very keen to get back to St John’s Point to improve upon the pictures we got last time. The problem with them was that it was a pretty overcast day and as there was blue sky this morning it seemed like an opportunity not to be missed. In addition, the lighthouse has yellow and black stripes, which is very unique and is one of things I like most about it. Driving past it would have felt very wrong. I was really pleased in the end to go back there. The joy of lighthouse revisits is that you so often notice smaller details that you didn’t see before. There is a narrow slipway leading up to the lighthouse from the coast, and there are a couple of signs clearly warning people that they use it at their own risk. On one of the walls around the compound were a number of stones with names and messages written on them. Many had the dates that people had visited. Just below these stones was a small area with a few items and a large stone explaining that it was in memory of a little boy, Noah, who only lived for 9 months. It was very sad and these things always touch you more when you have children of your own. I did think it was a wonderful thing for his family to have done. He may not have reached an age at which he could enjoy a lighthouse, but it will now always be an important place to his family. Another interesting observation from this visit was a banner on a gate near the entrance to the lighthouse. The tower’s optic is clearly under threat at the moment and the local community are, of course, wanting to challenge it. The campaign is being run by Lecale Lightkeepers, a cross-community group, and their banner calls for help to save their “iconic sweeping beam” with “Leave St John’s light alone” along the bottom. I am a huge fan of sweeping beams, you just can’t beat them and I’m always sad to see them go. The banner urges supporters of the campaign to email the Commissioners of Irish Lights. We followed our visit to St John’s Point with a quick stop at Ardglass Pier, another revisit. There’s not a lot to say about this one, but we got blue sky pictures again – once again an improvement upon last time. It was time for a little distance bagging on the stretch between Ardglass and Donaghadee. I very helpfully noticed (if I do say so myself) that a ferry ran across Strangford Narrows, which certainly made the journey a lot quicker. It also meant that we had the opportunity to see Angus Rock lighthouse from both sides of the entrance to Strangford Lough. Out came the zoom lens again and the best views of it were certainly from Kilclief on the west bank. We’d spotted Angus Rock on our first trip to Northern Ireland, but hadn’t made an effort to get as close to it as possible, so this was another chance to do just that. Our next distance viewing was of South Rock, also known as Kilwarlin lighthouse. While it isn’t looking too special now, it has an interesting history since it was first lit in 1797 and it was the first rock, or wave-washed, lighthouse in Ireland as a whole. From the coast of mainland Northern Ireland you can’t really see its true magnitude, but hopefully one day we will make it out there for a closer look. Passing Donaghadee without stopping to walk to the lighthouse should, quite frankly, be made illegal! Not wanting to break this new law I have just introduced, we spent a while on the pier there. By this time sunset was well and truly on its way, casting that wonderful warm glow over everything once again. The only problem with Donaghadee is that too many people seem to recognise the enjoyment to be had from walking to the lighthouse. While I love to advocate lighthouse bagging, I do like people to keep out of my pictures most of the time, unless I choose to have them there! Once again a great place and clearly somewhere that all ages enjoy judging by today’s visitors. On the coastal road north towards Belfast we spotted the black and white stripes of the Mew Island lighthouses off of the coast, precisely at the point my notes had suggested viewing it from. There was one final place to be visited before we could go to the ferry terminal. I alluded to the old Mew Island optic in my post yesterday, and how it has now been relocated to the Maritime Mile as part of the Titanic Belfast museum. During our first visit to Northern Ireland we had flown out to Mew Island in a helicopter (I had great fun, Bob was petrified when I took control though!) and we had seen the optic rotating in the lighthouse. Since then the optic has been replaced by a modern light. The optic is now being very well cared for and is beautifully presented and lit in its new home (which apparently is at the location of a former harbour lighthouse). There is a great deal of information on the boards surrounding it too about the history of the optic, the type of lens (it is one of only 30 Hyper-Radial lenses in the world for those interested) and the movement of it from the lighthouse to the Titanic Causeway. I was pleased to be visiting as it was getting dark to fully appreciate the display. I was also pleased that it is outside as it is accessible 24 hours a day and free of charge! There’s a lot of information about the lens at https://greatlighttq.org if you’d like to find out more. Back in October, at the start of what I called “the mad plan”, I alluded to the fact that I was preparing a list of lighthouses in the UK, Isle of Man and Channel Islands to be published. Well, since then progress has been made and, massively excitingly, Whittles Publishing are happy to publish it for me! I’m still not sure I believe it just yet, but it is going to happen and I have a deadline, which means that when I am not busy visiting lighthouses, writing blog posts, looking after two young children, working or sleeping, I am focussed only on getting the book done. I should add that we are currently looking at an early July 2019 release and I will, of course, post here any major developments. Aside from being excited in general about it actually being published, I am hoping to be able to help out people like the 2012 version of me who had the idea, to visit all of the UK mainland lighthouses, and could have done with a book like this to support the entire trip. Of course, the book covers islands too, as well as Northern Ireland. So, on the topic of Northern Ireland, that is precisely where I am writing today’s blog post from. You see, the book needs pictures and while the larger lights in this wonderful part of the world were visited during our honeymoon back in 2013, I had since become aware of a number of smaller lights that will be covered in the book and, of which I had no pictures. So there was only one thing for it – an extension to “the mad plan”. Two days in Northern Ireland it was! This morning started early – 4.45am is not a time I would ever really want to be up, but the lighthouses (and a ferry) beckoned so I had to go. The ferry crossing was great. I couldn’t convince Bob to watch Mamma Mia 2in the on-board cinema, so we settled for preparing for the two days ahead, while looking out for the lighthouses we were passing in the dark. Corsewall was the first, and what a wonderfully bright light it is. I don’t think it is ever possible to get bored of seeing the revolving glory of lights like that. Briefly turning away from Corsewall, I was greeted by the welcoming flash of one of my favourite Northern Irish lights: Black Head. I would recommend a stay at the lighthouse cottages at Black Head to anyone – lighthouse fan or not. I can guarantee you will love lighthouse by the time you leave! The final “flash” of the ferry crossing came from Mew Island – the only lighthouse I have visited by helicopter! It’s a brilliant lighthouse. Its lens was replaced a few years ago (you can see the old one in Belfast near the Titanic museum, which I am hoping we can do tomorrow – maybe) and the modern light isn’t the same, but it is just the way it goes. Upon arriving at Belfast, we headed straight for Coleraine where one of the Aquaholics boats was awaiting our arrival. It being the middle of winter, it’s not quite so easy to find boat operators, but Richard the skipper had agreed to take us out to see a few of the smaller harbour and river lights. Can I just say before I go any further, the boat was amazing?! We’d joked about having our own private charter on the way back from Caldey Island (mainly because we were there for such a short time), but this time we did and the boat was huge with indoor seating, outdoor seating, room to wander about inside and out, and I even got to sit in one of the “bouncy chairs” (or at least that’s what I call them) next to Richard! Anyway, off we set. Our first destination was the light on the end of the east pier at the entrance to the River Bann. It is possible to walk to it, but in the interests of time and while we were passing anyway, we went for a spin around it in the boat. Richard had said it would be choppy and it really was. It’s bizarre, just that small section of water at the entrance to the river you get some incredible waves – and today was a relatively calm day! The lighthouse isn’t one you would rave about (well, I wouldn’t anyway), but it was good to see it nonetheless. We hadn’t really known how long we would be out on the boat for today. We’d guessed it wouldn’t be long, but obviously not anticipated the distance required to get from Coleraine to the bridge across the River Foyle – it’s quite a way. Anyway, it gave us a chance to chat to Richard. He informed us that for a few years he’d taken out groups of lighthouse enthusiasts to Rathlin Island on the trips organised by John Eagle, who very sadly passed away very recently. It was one of John Eagle’s books that Bob had given me at the start of our honeymoon and we were both aware of his lighthouse tours of Ireland. It is a real sad loss and, from a personal point of view, I wish I’d had the chance to meet him. The next three lighthouses we spotted were in fact Southern Irish lights. Inishowen lighthouse was visible in the distance and then Warren Point a little closer. We then passed by the brilliant Moville light, which was actually my highlight of the day – even if I wasn’t there to visit Southern Irish lights. It was the first proper look I have had of a lighthouse in the Republic of Ireland and a very good first one it was too. Richard recalled seeing it when he was younger and thinking that on its skinny little iron legs it wouldn’t last long, but a number of years later it has proven him wrong. It’s got a lot of character and is something a bit different, which is always nice to see. Onwards we went to our first light in the River Foyle, Culmore Point. You can pretty much drive to Culmore Point, but I’m glad we saw it from the boat as it wouldn’t have been half as nice to see from the land. The tide was in at the time so half of the lighthouse (the half with its name on would not have been accessible anyway from the land). Unfortunately, someone had decided to “decorate” the tower with a large drawing, the details of which I won’t go into (Richard suggested PhotoShop might be in order, let’s just leave it at that). It’s not the most fascinating of lights, but it marked the beginning of a sort of style of lights that litter the River Foyle between its entrance and the bridge. Ballynagard was the next light, just a short distance away, that bore a resemblance to the Culmore light, although it didn’t bear its name – or the graffiti come to think of it. This one appears to be a bit harder to access from land, so we definitely went the right way about it. The next one was a major target for me. I had seen pictures of Otter Bank online and, in order to qualify for my list of lighthouse the structure must be able to be accessed internally. From what I had seen it was difficult to tell whether it was possible to get inside this tower. So, the key priority for the day was to try and work this out. The only problem with this was that the side on which there is a small platform with what looked sort of like a door opening was surrounded by shallow water. Fortunately, Richard is a particularly skilled skipper and managed to slowly edge around the tower while Bob crept on to the front of the boat to get as close to the side we needed to see as possible. I, of course, stood back like the queen and watched. Actually I didn’t really. I did try to get a look myself, but it was Bob’s pictures that helped me to make the final decision that, yes, it is possible to get inside. It may not lead anywhere now, but you can definitely get inside. I referred to it as the equivalent of a lighthouse bus shelter! Feeling very pleased and thinking that was us done in terms of what I needed to achieve in the Foyle, Richard suggested we go up river a little further as there were some more lights before the bridge. We passed the Brookhall light, which I knew had no internal access and this was reconfirmed. Onwards we went and as we got closer to the bridge we spotted a tower that looked fairly substantial. This tower, like Culmore, featured its name: Boom Hall. This one hadn’t even been on my radar and for the rest of the day we would call it the “unexpected lighthouse in the bagging area”. The tower had clearly not been operational for some time. It has what looks like a tree growing out of the top and the small walkway/jetty that used to link it to the river bank has long since gone leaving just the old iron legs that supported it. Interestingly, there is very little information available about this light, apart from an old picture here. 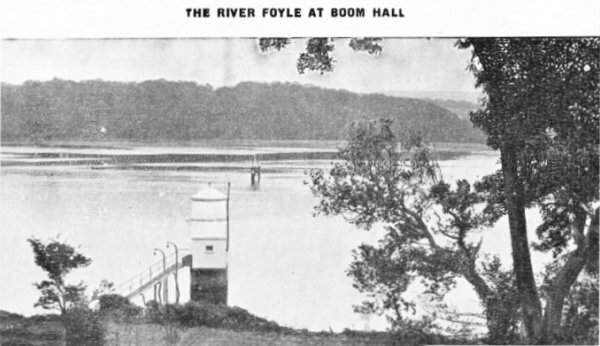 The name “Boom” may well come from the fact that this part of the river was the location of the boom barrier put in place by King James II’s army during the Siege of Derry in the 17th century. Most likely though is that it was built around the same time as the nearby Boom Hall (presumably that took its name from the boom barrier). Boom Hall is also in a particularly bad state of repair. So, this was a new one for me and I was very glad that Richard had suggested going a little further. On the way back to Coleraine, once we’d passed through the wild entrance to the River Bann again, we stopped for a little to look at the leading lights a short distance from the river mouth. I had been aware of them and we’d spotted them on the way out, but I wasn’t sure whether either of them would fulfil the criteria required for making my list. Although the views from the boat weren’t able to answer that it did give us an idea of the surrounding area and how it might be best to access them. Richard suggested walking around from the beach might be the quickest way. Saying farewell and thanks to Richard who had been so accommodating of my requirements and requests (and hadn’t looked at me strangely once when I was talking about getting inside these small lighthouses – very grateful for that), we set off as fast as we could for Castlerock as we were losing light by the minute and wanted to get to the leading lights while we could still see our way there. We’d been out on the boat a lot longer than we’d thought we would be and so lunch had been skipped, there were more pressing matters to deal with. We found the beach and it was an easy walk across the sand and then the dunes to the front of the two lights, which I was delighted to find had a door! It looks a little like it might fall apart at some stage, but it would still be possible to get inside it, if you had the right equipment, of course. I was fairly certain that if this one had a door then the rear would. The rear light wasn’t too far away and the route we took was nowhere near as foliage-filled as we had feared. It’s entirely different, structurally to the front light, and was easy enough to find. (Note to my friend John who will read this at some point: it’s very close to the 5th tee of Castlerock golf course when you get around to starting on the Irish lights!!) I was adamant that I should be the one to see if it had access inside first so the mountain goat (sorry, I mean Bob) waited patiently while I slid around to the back and peered in. It was one of those moments when you want to look, but you don’t just in case there is something out of a horror film waiting to jump out at you. So I looked far enough around to see that you could get inside (the remains of the door lay on the ground nearby) and then Bob took over and braved it. I did look in the end, once it was confirmed that the coast was indeed clear. There wasn’t really much to see at all, apart from a cable – you know you are scraping the barrel when all you can mention is a cable! We didn’t hang around for too long as there was still one more light to be seen while we were in the area. It was getting darker by the time we got back to the car, but it would have annoyed me too much to have left one single light to visit in the area when we were so close. So, Portstewart it was. As I suspected it was easy enough to find. It’s a funny little thing. Like a little kiosk where you might get ice cream on a summer’s day, except it has a rather intriguing light on top. I can’t really explain it so well, so will include a picture to show you instead.